Hooray led from start to finish as she powered through the soft ground to claim the Group One Adnams Cheveley Park Stakes for owners Cheveley Park Stud, trainer Sir Mark Prescott and jockey Seb Sanders. Her lead was never seriously threatened and at the finish she had four and a half lengths to spare over Rimth. 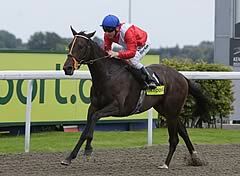 The daughter of Pivotal, returned the 7/2 favourite, was winning her first Group One race, having previously triumphed in Pattern company when collecting the Group Two Lowther Stakes at York and the Group Three Sirenia Stakes at Kempton. Winning trainer Sir Mark Prescott said: “When they are as useful as she is on very fast ground, the unknown factor is when it starts to rain. I was obviously very worried about her with the rain because I thought that, if it stayed firm, she was probably the best filly in the field. Looks like the trainer was wrong again! “She has kept improving and improving. I think that when we stopped restraining her and let her get on and do what she wanted - that was the making of her. “Even though she is mine, I thought that she was very impressive. At the top of the hill, you have that lovely thing of looking to see if anything is going well behind you - it’s a rare thing in a Group One. I thought that she was very impressive. “I wouldn’t think that she would stay a mile. I hope I am wrong again but I wouldn’t think that she would stay that far. She has got bags of speed and she would have a job keeping that up for a mile. “The owners would probably love to have a go at the 1000 Guineas if she does well through the winter but we have always regarded her as a two-year-old. “The change in tactics, in allowing her to race from the front, has been everything for this filly. She still works in behind other horses at home, as with front runners I think you have to keep that electric speed for the racecourse. Seb Sanders added: “Her best performance was on very quick ground and we were a bit disappointed with her at Newbury on softish ground but that was a different kind of soft ground - it was watered ground that had been heavily rained on. She handled the ground today and she is improving all of the time and was very impressive there. “She was very fractious early doors and we thought holding her up and trying to get her to relax was the thing to do. It probably was the right thing to do at the time because, once you start making the running, there is no return. But she has done nothing but improve since we have started to make the running on her. Trainer Paul Cole was pleased with Rimth’s second place behind runaway winner Hooray in the Adnams Cheveley Park Stakes. “The winner was very impressive and I think she’s getting better,” said Cole. “But we did what we could and our filly tries her heart out and liked this ground. She’d had a couple of bits of bad luck in her previous two runs and that will be it for this season. But trainer John Gosden is hoping that third-placed Maqaasid might develop into a Classic contender next season. “Things went wrong for her when she ran at York and got a bump,” said Gosden. “But I was pleased to see her relax today and she finished well even though she didn’t like this ground. It was a great performance from the winner.